I enjoy reading fiction, biography, and history about the century between Waterloo (1815) and World War I (1914), especially about Britain during that time. THERE was not a single year in Queen Victoria's long reign in which somewhere in the world her soldiers were not fighting for her and for her empire. From 1837 until 1901, in Asia, Africa, Arabia and elsewhere, British troops were engaged in almost constant combat. It was the price of empire, of world leadership, and of national pride—and it was paid, usually without qualms or regrets or very much thought. The first conflict in Victoria's reign was a brief and unsuccessful rebellion against her rule in Canada. Soon there was trouble in Afghanistan (which would recur). Several chapters are devoted to the Indian Mutiny. And on though many more until the Boer War at the end of the Queen Empress's life. 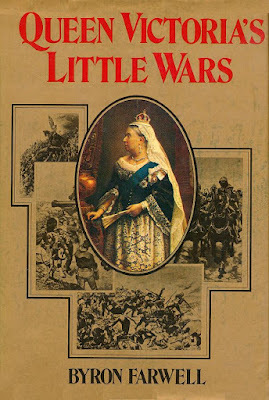 The book covers much of the same history as do George MacDonald Frazier's very entertaining fictional adventures of Sir Harry Flashman.